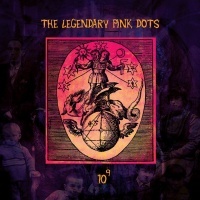 Another instalment in the hugely expansive catalogue of the Legendary Pink Dots, 10 To The Power of 9 gathers together two volumes originally released on vinyl in coloured editions of 499 copies. Mixing Edward Ka-Spel's mythologizing and visionary storytelling on a playful mixture of electronic based songs peppered with atmospherics and wayward meandering sound excursions, 10 To The Power of 9 is based on a Ka-Spel constructed conspiracy theory about 10 men who rule the world from secret hideouts in the Himalayas but direct the world from meetings held in a backroom in London. The entire concept echoes the conspiracy theories concerning Davos, Bilderberg and The Trilateral Commission - and dare I say it the "new world order" - where representatives of the elite, including academics, business leaders, and politicians, gather to debate the world's agenda and the big issues of the day. The scene is set on 'Ten O'er Nine' where in a backroom of an office in London, one of the 10 seats lies empty. With gentle diction Ka-Spel relates the impact of the absence of one of the elite member over crunchy textures, slow guitar twang and washes of dreamy electronics. One of the highlights of 10 To The Power of 9 comes early in the form of 'The Virgin Queen' which throbs to a whimsical rubbery thumping rhythm riddled with elastic twang. Ka-Spel is in fine form here, as he sings in his customary nasally whine of an unnamed monarch who unleashed war setting "brother against brother". Much of 10 To The Power of 9 is taken by sound excursions like the industrial atmospherics of 'Primordial Soup' replete with metallic percussive crashes and Ka-Spel's indistinct harmonies. The hallucinogenic 'Malice' is spliced with sped-up Pinky and Perky type vocals of subverted nursery rhymes over fried electronics and errant stabbing synths, travelling though synthwork before the Dots go all Krautrock on 'Freak Flag' with a collage of samples and open-ended space rock guitar riffing. There are slight diversions throughout, such as the pulsing electro-pop of 'Your Humble Servant' which is given a sinister edge by Ka-Spel's treated whisperings. Things get slightly more dramatic on 'Feeding Time', which on vinyl closes the first volume, where Ka-Spel over frosted tones, bleeps and sound squiggles signals the intent: "we're here to please" with a need for variety and showbiz, which in its references to music hall styles displays a distinct Englishness which characterises much of the Legendary Pink Dots discography. "It's feeding time" he continues fuelling the concept, before settling into an uneasy subdued atmosphere. Volume 2 opens with 'Olympus 2020' with deep tones uttering a monologue intoning - "and the meek shall inherit the earth: the dirt, the ash, the crust, the dust, the stench...."- personifying the mood of the discontented masters, ensconced in their mountaintop, over effects and suitably serene keyboards. The warbling tones and disembodied piano notes of 'Open Season' are drenched in atmo-synths, where Ka-Spel in a restrained sneer obliquely revisits 'The Virgin Queen' in lyrics alluding to "targets" with a snare drum echoing dub techniques. 'Room For Two' is an atmospheric electronic piece, laden with a dusty stylus sound, where couched in childlike melodies, Ka-Spel sings of a haven, a solace, far removed from the clutches of the ruling elite, while whispered mutterings merge with drifting atmospherics culminating with beckoning voices: "please come home" before the looped ending of "I can't find him on the internet".